Privacy concerns related to cookies. Animated GIF files that contain infinte looping animation. Pop-up and pop-under windows that flood your screen with obnoxious advertisments and other nuisances. The Mozilla browser (available from: www.mozilla.org) has built-in features that can tame these annoyances for free. The following tips assume that you have already downloaded and installed the Mozilla browser suite. It is recommended that you use version 1.4 and higher. Note: The acronym “DVD” originally meant “digital video disk” but since the disk format can be used for more than just video, DVD is unofficially refered to as: “digital versatile disk”. In 1999, the DVD Forum (the creators of the DVD specification and format) declared that for the purposes of international standards, DVD is just the three letters (with no special meaning). The Trinidad and Tobago Computer Society was one of the exhibitors at the Free, Libre and Open Source Software (FLOS) Conference. The Conference and Exhibition was held at the Central Bank, Port of Spain on Thursday 26th and Friday 27th June 2003. 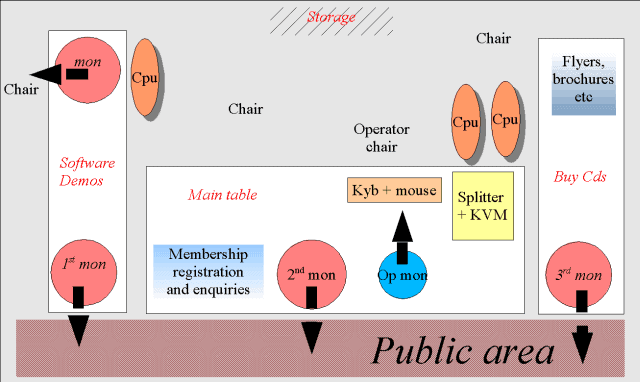 This page provides details about Society activities for the conference. NOTE: Programs on the GNUWin II CD were updated by the TTCS for the FLOS Software Conference. You can get the CD for TT$20. Please email us at: ttcs at opus.co.tt and let us know if you wish to purchase a CD. 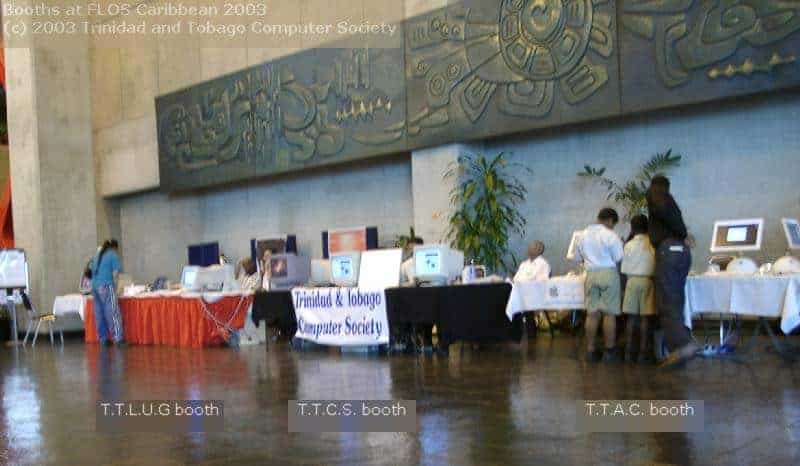 Preparations for the Free, Libre and Open Source Software (FLOS) Conference began in early 2003 when we offered space to operate a booth in the DOT Org section of the main exhibition area by the conference organisers: the Caribbean Centre for Monetary Studies and Trinidad and Tobago Linux Users Group. During March and April, members were asked to contribute ideas and suggestions as to what could be done at the booth; they were also kept updated on the status of the conference thanks to regular email notices and live reports from Richard J at TTCS Pizza Limes. the Trinidad and Tobago Computer Society. the GNUWin II CD: a CD-ROM containing a variety of open source software for the Windows operating system. Knoppix: a GNU/Linux distribution that runs completely from the CD (no hard drive installation required) and includes recent Linux software and desktop environments. Sunday 25th May 2003: Created the initial booth layout sketch and equipment list. Saturday 31st May 2003: Timetable for conference preparations finalised. Began planning booth activities. Saturday 7th June 2003: Draft versions of the 3 OpenOffice.Org Impress presentations presented to members. CD label designs modified. Saturday 14th June 2003: Finalised: the Impress presentations, the Society brochure, the one-page flyer (for use with the CD sales), tested the video splitter for the first time. Saturday 21st June 2003: Tables, chairs and computer equipment were set-up, plugged in and tested. The initial layout was modified to accomadate a “demo” machine. This computer would be used by anyone who desired hands-on experiance with the GNUWin software or Knoppix. Everything worked smoothly. The “Booth Crew” and daily timetable were also finalised. Monday 23rd June 2003: Informal site visit to the exhibition area at the Central Bank. installed and tested the GNUWin software on the “demo” machine. burned CDs for sale during the Exhibition. The Booth was located on the western side of the exhibition area between the TTLUG and TTAC booths. One 4-port ethernet network hub. Applications and games from the GNUWin II CD-ROM. An offline version of the Trinidad and Tobago Computer Society website. Two of the machines were plugged into the KVM and video splitter. These were used to demonstrate the software on the GNUWin II CD and the Knoppix live Linux distro. The third machine was a “hands-on” demo machine where visitors to the booth were able to use the GNUWIN software. In the case of Knoppix, visitors could boot the machine themselves and use all the Linux software on the disk. There was a mix-up in the scheduling and we were unable to set up the booth on Wednesday 25th. This meant that we had to spend the first three hours of Thursday morning transporting and setting up tables and equipment. Fortunately, our staging area for the Conference was located in Port of Spain so only a little time was lost due to transportation. The Conference was well attended on Day One, in fact so many people were present that the initial area set aside for lunch (on the 16th floor) could not accomadate everyone. The Conference organisers decided to split the group: half would take lunch immediately while the other half would go downstairs to the official launch of the Exhibition. The original schedule called for the launch to take place at 1300 hrs. Many of the Conference attendees were curious about the Knoppix CD since many of them were of the belief that GNU/Linux could only work if it was installed on a hard drive. The GNUWin CD was very popular with visitors since many of them were unaware that there was open source software available for the Windows operating system. Others who were aware, were surprised at the variety and high quality of the available applications. Many of the visitors took the opportunity to try out both the Knoppix distro and the various applications from the GNUWin CD on the Demo machine. We had 30 CDs (19 GNUWin and 11 Knoppix) alloted for the two days of the conference. All were sold by closing time (1700 hrs) on Thursday. The traffic from Conference attendees on Friday was not as heavy as on Thursday but more members of the general public, Central Bank employees and TTCS members visited the booth. In a way, less traffic was a good thing because visitors got to use the Demo machine for a longer period of time. A second batch of 23 CDs (11 Knoppix, 12 GNUWin) was burned overnight for the second day of the conference. All were sold out by noon. We had to purchase and burn additional CD-Rs, print new CD labels and handouts. Closing time on Day Two was about 1715 hrs and all equipment was returned to the staging area by 1830 hrs. There was a get-together after the close of the conference at Pizza Hut Roxy Roundabout (it was not a TTCS Pizza Lime). Some of the TTCS booth crew attended along with other Conference persons such as Robin ‘Roblimo’ Miller, David Sugar and Steve Traguott. FYI: We sold a total of 30 Knoppix CDs and 40 GNUWin CDs. Overall there was a good level of enthusiasm for the concept and (perhaps more importantly) the products of Free, Libre and Open Source Software (FLOS). Our (TTCS) experiance with booth visitors suggests that local computer users are willing to experiment with alternatives to expensive, proprietary software. If they will continue to use it after the initial “thrill” has worn off is unknown. Awareness of the existance of Free, Libre and Open Source Software (FLOS) is another problem. Local user groups and individuals have been promoting FLOS concepts and products for some time now but mainstream users have yet to hear about them. Many mainstream users who know about Free, Libre and Open Source Software (FLOS) are reluctant to try it because they fear it is not as good as commercial, proprietary software. ndividuals and comapnies have towards it. There are no short cuts to success. Difficult and thankless work is required to achieve a successful “grassroots” movement. The “grassroots” movement will be in direct competition with multi-million dollar advertising campaigns and other promotional efforts from financially wealthy proprietary software companies. Acceptance of FLOS requires a change in attitude amongst potential users. Changing that attitude will be difficult. FLOS can only achieve its full potential if there is a change in the local attitude towards: self-sufficiency, computers/information technology, data security, the local economy and expenditure of local tax dollars. The FLOS Caribbean Conference was a first step in raising awareness of FLOS and addressing some of the issues mentioned in this list of comments. Attendess, presenters and the organisers must now capitalise on this surge of interest and show how FLOS can truly benefit this nation. The “Booth Crew”: Dev, Paul, Colin, Helen, James. Dev, Paul and Anil for donating equipment. Richard, our liason with the conference organisers. All members who took time out to visit us at the Conference booth. All members who contributed ideas, comments and suggestions via email and helped us to have the best booth possible. The Trinidad and Tobago Linux Users Group (TTLUG) and the Caribbean Centre for Monetary Studies (CCMS) for the invitation to take part in the Conference and for providing the exhibition space. GNUWin II is a compilation of Free/Open Source software for the Microsoft Windows® platform. One of the main features of this software is that most of the programs on the CD are also available for free/Open Source operating systems, such as GNU/Linux, debian, FreeBSD, etc. The compilation was created by: GNU Generation a team of students from the: EPFL. 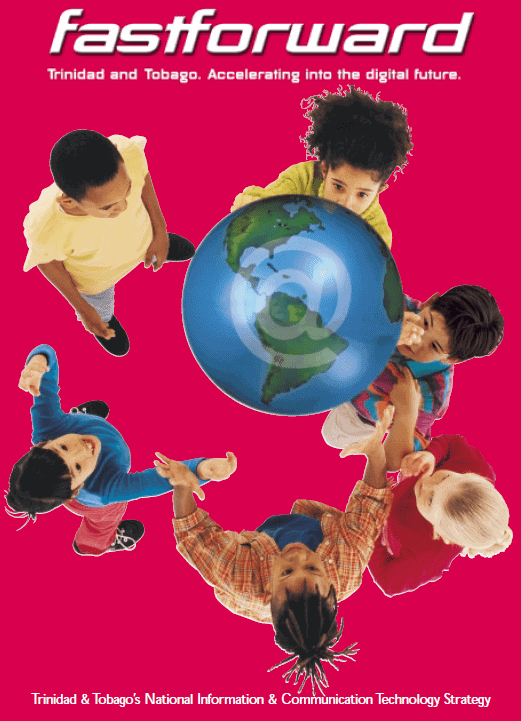 The compilation was developed in Europe and is available in the following languages: English, Catalan, Portuguese, Spanish, German, Italian and French. The Trinidad and Tobago Computer Society held two types of meetings : Pizza Limes and Tech Meetings. A Pizza Lime is the name given to our monthly discussion forum which is usually held at Pizza Hut, Roxy Roundabout, Port of Spain on the second Wednesday of the month. The tech meeting is when we have computers on site to demonstrate a particular type of hardware or software.